The University of New Brunswick is forging a formal partnership with a major Israeli cybersecurity initiative to spur greater innovation, economic development and collaboration in the field of cyber research. 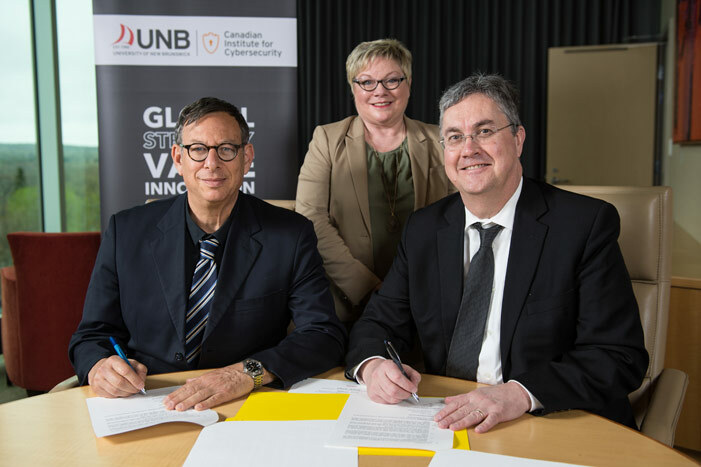 UNB is the first Canadian university to sign a collaboration agreement with CyberSpark, Israel's cyber innovation arena – a move both sides herald as a path to greater advancement and economic opportunity in cybersecurity. Israel has emerged as a global leader in developing cybersecurity solutions and companies. With exports totaling $6 billion, or approximately 10 per cent of the worldwide market in 2016, and 22 per cent of private investment, Israel is home to more than 430 cybersecurity companies and 40 research and development centres of foreign multinationals including Canadian companies. Dr. Campbell and Roni Zehavi, CEO of CyberSpark, signed a memorandum of understanding formalizing the research partnership at a ceremony today at the university’s Fredericton campus. CyberSpark was launched in Beersheba, Israel, in 2014 by Israeli Prime Minister Benjamin Netanyahu with the goal of bringing together local companies, global multinationals, all levels of government, the military and academia. Companies that locate in Beersheba receive grants as a proportion of salaries paid to workers and companies that keep intellectual property in Israel receive additional compensations. Mr. Zehavi says the model has been a success and CyberSpark has become a lightning rod for attracting foreign multinationals and other research collaborators. The partnership is expected to create greater innovation and economic opportunities for New Brunswick. “The training of highly qualified people as well as job and company creation with another country has the potential to grow the province’s economy,” says Dr. Ali Ghorbani, director of the Canadian Institute of Cybersecurity at UNB and the university’s dean of computer science. Mr. Zehavi says CyberSpark quickly became interested in UNB’s cybersecurity research after a visit to the university last year.